An Afghan National army soldier stands guard a checkpoint on the outskirts of Kabul, Afghanistan, Aug. 21, 2017. Deep in the mountains of eastern Afghanistan, on the front lines against Taliban and Islamic State fighters, U.S. military commanders say they need more forces to better train Afghan soldiers to combat the escalating threat. They're hoping President Donald Trump heeds their calls when he outlines his new war strategy. Trump has given his military leaders greater authority to manage America's military efforts. But a new Afghan strategy has been held up for months amid a contentious review process that has included the president publicly voicing his dissatisfaction with the options. He'll finally outline his plan in a primetime television address Monday. 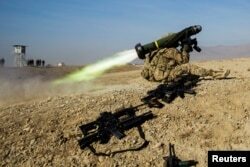 FILE - A U.S. soldier from Dragon Troop of the 3rd Cavalry Regiment fires a Javelin missile system during their first training exercise of the new year near operating base Gamberi in the Laghman province of Afghanistan Jan. 1, 2015. 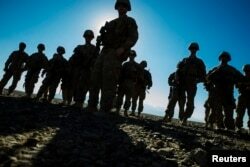 FILE - U.S. soldiers from Dragon Company of the 3rd Cavalry Regiment are silhouetted as they stand outside their vehicles during a mortar exercise near forward operating base Gamberi in the Laghman province of Afghanistan, Dec. 26, 2014. "We took them from `we can help, but if we do it, you'll never figure it out,"' said Maj. Richard Anderson, operations adviser for 201st corps. "At times it seems like a drag is there, but once you get them to the point ... they can do it." "I want to have enough equipment and advisers to keep my troops equipped, and help against the enemy," said Lt. Gen. Mohammad Zaman Waziri, 201st Corps commander. More advisers, he added, could help the corps get light and heavy weapons and the training needed to use them, "because the enemy has a lot of capability and has not weakened as much as we would want them to." "If there is any bigger bomb than MOAB, they should drop that, too," he said.